Sephra is a world-renowned provider of high quality chocolate fountains; let’s just say they gave Sage Tree Solutions it’s biggest sweet tooth ever. Sephra needed a website that could help grow its business by making their products available for purchase online, so we integrated the website with Magneto. We also helped them integrate their social media avenues including their WordPress blog and Facebook page. Visitors of the site also have the option to sign up for Sephra’s newsletter, which is integrated as part of the site. 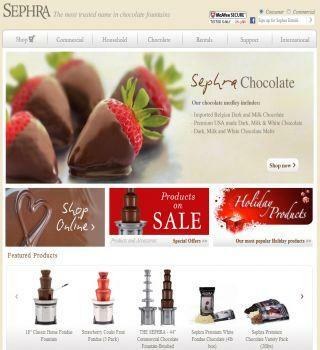 Sephra’s eCommerce website allows visitors and client’s to stay engaged with the products and to order them anytime they get a chocolate craving.